The natural choice for 12,000 years. Wool has protected our species from the elements for centuries. You can bend a single strand over 20,000 times, and stretch it up to 40% of it’s original length. The scaled surface of each fiber grabs on to its neighbors, which ensures the longevity of loft that traps warm air. Wool fibers absorb up to 30% of their weight in water into their hollow cores without feeling clammy. Excess moisture wrings out with slight pressure. Since water retains an amazing amount of energy, wearing a garment that has equalized with your body’s environment will actually shield you from sudden changes in the temperature. 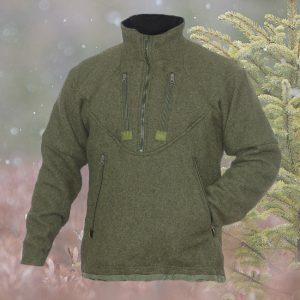 The Keratin proteins of wool are naturally flame resistant, a bonus for wilderness cooking. Many manufacturers have shied away from wool because they perceive synthetic fibers as easier to maintain. When you consider that wool hinders the growth of odor causing bacteria, and sheds the dirt and oils that necessitate cleaning, you’re likely to launder it less anyway. 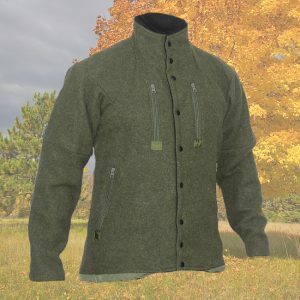 Oddly enough, washing actually improves the loft that makes our Wool Blanket/Boreal Shirt, Jackpine Vest, Grey Fox Pullover, and Camp Coat the natural choices for your our outdoor adventures. We buy our 100% wool blankets. Then we drive them to the laundromat. Each gets washed on hot, followed by a roasting in the dryer. This process of ‘fulling’ creates loft and increases the density of the fabric. We make mounds of lint too. More importantly, it removes most of the shrinkage common in natural fibers. Heck, we even wash our nylon webbing, binding tape, and zipper chain to be thorough. Why the fuss? 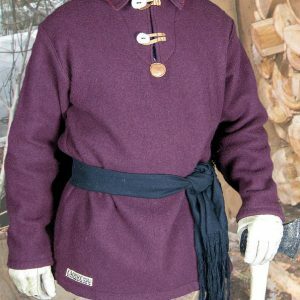 Remember the first Fleece fabrics? They were puffy, breathable, and worked great as a warm layer- we kinda went for that. 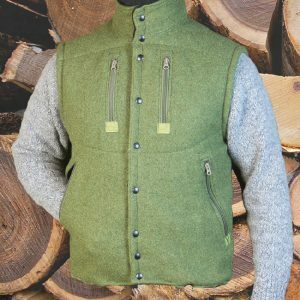 Unlike stiffer wool coats, ours don’t mind a little vigorous activity because they release perspiration as well as they insulate. Sure, you can wear them as an outer layer, but they really shine as part of a system: Under the shell in bitter cold, moving towards the surface as you speed up or the temps rise. We aren’t trying to reinvent the wheel. Each coat, vest, or shirt will gain character with age, but retain its original performance. Our Wool fabric will pill up, especially when it is new. Despite that, it will never delaminate, degrade from UV exposure, or melt. From the day we ship it, till the day it’s nothing but stitches and fuzz, it will insulate, wick moisture, and repel dirt. To prolong the working life, we’ve set all our grommets and snaps in reinforced nylon webbing. Our cord locks and draw cords can be serviced in the field. We’ve reinforced high wear areas like elbows and pocket edges. We’ve also top stitched prominent seams to protect them from pack straps. Invulnerable? No. Repairable? Absolutely.